ABOVE: An Alilaguna Blue Line airport boat cruises down the Giudecca Canal on its way to the Marittima cruise basin. Alilaguna airport boats run frequently between Venice Marco Polo Airport and stops throughout Venice's historic center, including such popular locations as San Marco (where you'll find the Piazza and the Basilica) and the Marittima cruise port. They also serve the islands of Murano, Giudecca, and the Lido di Venezia. Boats of Linea Blu, Linea Arancio, and (from spring through fall) Linea Rossa make it easy to reach hotels in both the prime tourist areas and Venice's quieter, less trafficked neighborhoods. 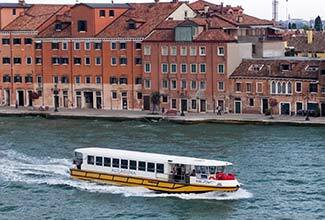 On this page, we've grouped hotels in the city center, Giudecca, and Murano by their proximity to Alilaguna waterbus landings. (Asterisks represent star ratings.) To see where the landings are, view our large-screen Venice Orientation Map. For information about waterbus landings, see our ACTV and Alilaguna Station Guide. See "Fondamente Nove" listings under Linea Blu above. See "San Marco (Giardinetti)" listings under Linea Blu above.